Albinos in Africa suffer daily sunburn because they lack the means and the knowledge to protect their vulnerable skin against the sharp sun. 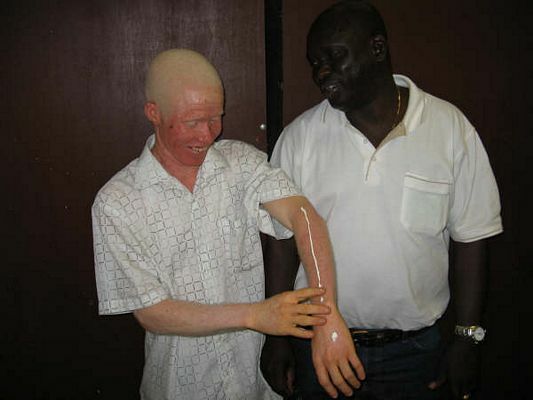 This daily exposure to the sun is a cause of many skin complaints and skin cancers among the African albinos. Albinos should protect their eyes from UV light with good sunglasses. They should also protect their skin by covering clothing and wearing a hat. However the most important protection is the use of a good sun lotion. A high protective factor of at least 30 is necessary to protect the skin against skin cancer. For African albinos these resources are not always available and there is also much ignorance concerning albinism. Finally albinos in Africa frequently have social problems through being “different”. Through the ignorance about albinism people look in the spiritual world for a reason for the “whiteness” of albinos. This gives rise to the idea that albinos are in touch with the spirits and have special powers in their blood and bones. People also think that albinos are mentally handicapped or that they bring bad luck. The often suffer discrimination because of these ideas.